The Godspell chorus from Central Catholic rehearses. By coincidence, three Catholic high schools are performing the musical this month. The Godspell chorus from St. Mary’s Academy rehearses. By coincidence, three Catholic high schools are performing the musical this month. When the 1971 parable-centered musical Godspell had a 2011 revival on Broadway, it was less than a smash. But the play, which ends with a call to spread the Good News, has emerged into a whole new generation. 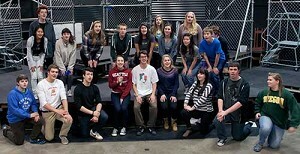 Three Portland area Catholic high schools have chosen to stage Godspell this month and directors say students are fired up. 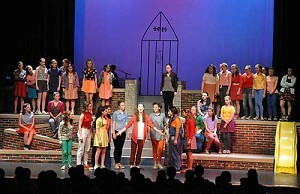 “It’s a big, joyful coincidence,” says Tom Graff, who is directing Godspell at Central Catholic in Southeast Portland. He acted in the musical in 1974. The Central Catholic version gathers disenfranchised youths who are grouped according to how they dress. As different life philosophies are introduced in a fugue, the young people re-group according to what they think. Then John the Baptist appears, telling all to prepare the way of the Lord. Chaos gives way to compelling order. The youths, who have bucked structure, find their true selves amid Jesus’ teaching and life. Graff, who acted in Godspell in 1974 and led later stagings, says his direction now focuses more on contemplation. Central Catholic performances are set for March 6, 7, 12, 13, 14 and 15. “The kids are captivated. Hook line and sinker,” says Shannon More, in her 10th year as drama director at St. Mary’s Academy, a school for girls in downtown Portland. The St. Mary’s version, with remaining performances March 7 and 8, is set in a nondescript urban courtyard where girls learn from Jesus that life is all about love. At Valley Catholic in Beaverton, where the show runs March 6-8 and March 13-15, director Ginnie Sutfin says the message of community, compassion and love are relevant to audience and cast. The Valley Catholic production is set on a modern playground with contemporary costumes. Sutfin says a lot of her show developed from improvisation; Though the parables are set, Godspell offers directors leeway elsewhere. Sutfin is friends with the technical director at St. Mary’s and the two have sent one another good luck messages.